FREE upgrade if you already have an existing system! Our upgrade allows you and the service provider of "your"choosing 24/7 access "WITHOUT" having to have a key. Kill bugs where they live, hide and breed, inside of walls! The Pest Guard System® is a network of tubing that can be installed throughout the walls of any new construction. The tubing has small perforations every ten inches, and is linked to an exterior service port that allows a technician access without having to invade the privacy of your home. Periodically, as needed, the technician will access this port and inject an EPA approved material. This material will then be dispersed through the network with a blast of nitrogen which propels the material as a very fine mist from the designated perforated tubing, treating virtually every wall and void throughout the structure. Behind and inside walls and voids never before accessible without drilling holes in the wall board and tiled areas. Q Would I rather have a pest control technician wearing dirty boots, spraying pesticides all over my new floor where my kids and pets are exposed, or should I install PEST GUARD SYSTEM® and keep the pesticides limited to inside the walls where bugs live and breed? The choice is simple! JUST TUBE IT with PEST GUARD SYSTEM®, combined with regularly scheduled exterior treatment, establishes a protective barrier for a pest free living environment. 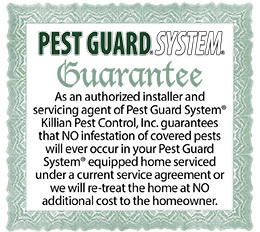 If a problem does arise before your next scheduled service, your PEST GUARD SYSTEM® authorized technician will re-treat your home at no additional cost. No matter the project, install Pest Guard System® today! NOTE: 70% of all bedbugs live in the walls, not the bed. JUST TUBE IT and stay ahead of the problem! We offer FREE upgrade with service to all builder installed systems!